'Jasper's gesture' has an unusual and irregular polygon shape. 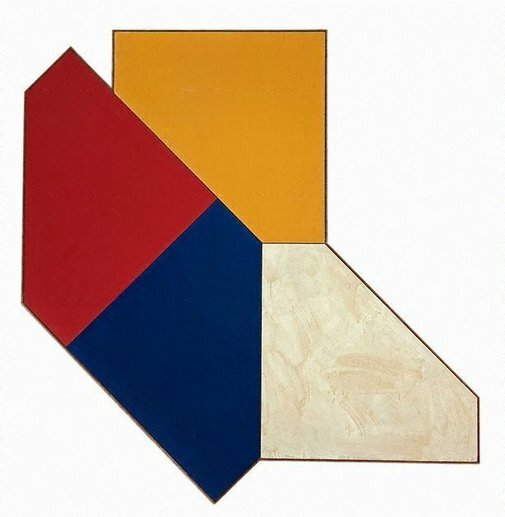 Like other artists at this time, Tony McGillick was exploring the idea that the shape of a painting need not be confined to the 'neutral' convention of the square, rectangle, oval or circle, but could be a dynamic part of the composition. McGillick also focused on colour and its interaction within the painting. The flat surfaces and synthetic colours contrast with the single white panel in painterly encaustic (pigment and wax). This work was painted in Sydney after McGillick returned from London via America in the early 1960s where he had seen the work of American colour-field painters. The title however is a tribute to American artist Jasper Johns, whose influence helped to formulate McGillick's ideas and who often used encaustic. Signed u.l. verso, blue ball-point pen ".../ Tony McGillick". Not dated. George Berger., Sydney Jewish news , 'Aspden, McGillick and Mirka Mora', Sydney, 14 Jun 1968. Review of 1968 Central Street Gallery exhibition. A work titled 'Jasper's Garden' is mentioned, as is most likely the painting 'Jasper's Gesture', as no painting of that name is listed in the catalogue. Michael Desmond, Contemporary: Art Gallery of New South Wales Contemporary Collection , 'Abstraction', pg. 16-59, Sydney, 2006, 44, 45 (colour illus.). Noel Hutchison., Honi soit , 'Noel Hutchison tracks around the Galleries', Sydney, Jun 1968. Review of Central Street Gallery exhibition, June 1968. Linda van Nunen, Brought to light II: Australian art 1966-2006 , 'Patterns of experience: Sydney abstraction', pg. 32-42, South Brisbane, 2007, 40 (colour illus.). Jill Sykes, Look , 'Small and temporary: but it's a big pointer to the future', pg. 28-29, Sydney, Sep 2011, 28 (colour illus.). Michael Wardell, Look , 'Thanks to a generous benefactor', pg. 14-15, Sydney, Oct 2003, 14 (colour illus.). Natalie Wilson, Tackling THE FIELD , 'Tackling The Field', pg. 1-29, Sydney, 2009, 9 (colour illus. ), 25. NOTE: This work was hung in an adjoining room for the duration of the 'Tackling THE FIELD' collection focus display. Survey 6: Tony McGillick , Melbourne, 1978. Produced to accompany the exhibition of the same name shown at the NGV in 1978.